The lady falcon's competed with passion and resilience on Thursday night at Grace of Raliegh. 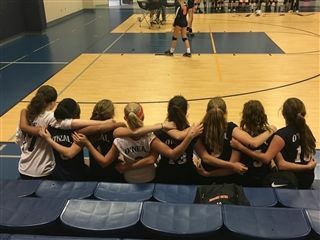 In the second game, their continued energy and enthusiasm sparked a late comeback against the Eagles. 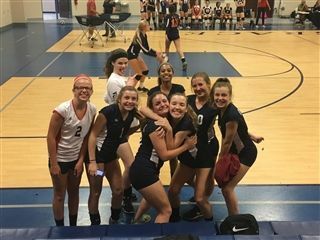 It was a bit too little, too late, but overall the girls showed great improvement and all team members were instrumental in the overall energy on the court. 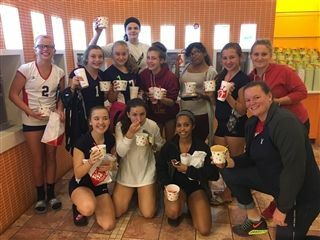 After the game, the lady's enjoyed a trip to a local frozen yogurt shop to celebrate the final road game of the season. There were smiles all around, as the girls compared the best way to build a frozen yogurt treat. Coach Brase quickly learned to two tricks to the trade: mix icecream flavors and add lots of candy toppings. As the girls reminded her, what is an desert without a lot of candy! The girls will wrap up their 2016 season with one final home game on Tuesday October 11th at 4pm. It is the annual Pink Game, and the girls are looking forward to sporting their best pink for the game!